My third Socialists In Congress Or Senate profile looks at Chairman of the powerful Congressional Judiciary Committee, rep John Conyers (Democrat, Michigan). In his late '70s, Conyers is one of the most powerful figures in Congress and easily one of the most radical. First elected to Congress in 1964, Conyers was founder of the powerful Congressional Black Caucus and is a leader of the radical Congressional Progressive Caucus. John Conyers father had been a leading activist and later official in the communist created, United Autoworkers of America. Conyers Jr. was also a member of the UAW in the late 1940's (in Local 900), which was probably a factor in his early radicalisation. During the '50s Conyers served on the executive of the National Lawyers Guild. A well known front of the Communist Party USA, the NLG was also the US affiliate of the Soviet legal front, the International Association of Democratic Lawyers. For many years Conyers was very close to the late Congressman George Crockett Jr., who was once a lawyer on the CPUSA's defense team in both the Foley Square trial of Communist Party leaders as well as in the Rosenberg spy case. Another friend was Coleman Young, a long-time covert member of the CPUSA, who became the Democratic Party mayor of Detroit during the 70's and early 80's. Detroit was and is, a CPUSA stronghold. The city's Democratic Party machine was heavily infiltrated by the CPUSA and sympathisers dominated the City Council for many years. Conyers was also closely linked to another CPUSA front, the US Peace Council and its Soviet front parent body, the World Peace Council. In 1975 and 1978, Conyers was a host/greeter for delegations from the World Peace Council that visited Detroit and Washington DC, respectively. Conyers was a sponsor of, and keynote speaker at the founding conference of the US Peace Council in November 1979 (Daily World, November 13 1979). He regularly participated in many USPC conferences and local events including the November 14-15, 1981 "Rally to Protest the Reagan Administration's Budget Cuts and War Prepar-ations", in New York City. 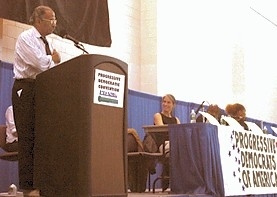 In 1987, the US Peace Council held its "Fifth National Conference" in Detroit and among those honored were Conyers and Crockett, City Council President Erma Henderson, and Councillor and USPC Board member, Maryann Mahaffey. 1970's Sponsor of numerous "Hanoi Lobby" united fronts, including the New Mobilization to End the War in Vietnam, and its successors, PCJP and NPAC, both dominated by the CPUSA and the Socialist Workers Party, respectively. 1973-75 Sponsor of the Political Rights Defense Fund, which was created by the SWP and aided by the CPUSA, to stop government surveillance of communist and subversives groups. 1973 Sponsor of the Hanoi aid-program known as "Medical Aid for Indochina" along with a dozen other Democratic congressmen. 1974 May 10th, Conyers addressed an audience of 500 at the Trinity Methodist Church in Detroit during the opening rally of the convention of the Communist-front National Alliance Against Racism and Political Repression. The meeting was chaired by then-Communist Party Central Committee member, Charlene Mitchell. 1978 Sponsor of "March and Lobby, Jobs for Youth" a CPUSA front run by their "Youth March for Jobs Committee". Other sponsors included Detroit City Councillors Clyde Cleveland and Maryann Mahaffey. 1978 Sponsor, "World Conference in Solidarity with Chile", (Daily World, 9th December 1978. One co-sponsor was Conyers' friend, Detroit's covert communist Mayor, Coleman Young. 1978 a "Dinner honoring Rep. John Conyers was sponsored by the Chicago Alliance Against Racist and Political Repression". The CAARPR was the CPUSA-dominated chapter of the old Angela Davis Defense Committee (a wholly CPUSA affair) which became the National Alliance Against Racist and Political Repression in 1973, again under CPUSA control. 1979 Conyers sent a message to CPUSA leader Claude Lightfoot and the CPUSA "salute" held to "pay tribute to one of those who has shaped that history (ie of "Black people"). The Daily World of February 15th 1979, headlined "800 crowd Chicago hotel to honor Claude Lightfoot." 1983 When the Soviets shot down the Korean civilian airliner KAL007, Congress reacted with a strong condemnation, with the exception of Conyers and his friend Crockett. According to the Washington Post of September 15th 1983, cover story "House Acts as One on Soviet Deed: United in Outrage, Legislators Vote to Condemn, 416-0," was the information. "The normally contentious and divided House united yesterday in strongly condemning the Soviet Union for shooting down a Korean jetliner that carried one of its own members, Rep. Larry McDonald (D-Ga), to his death. The vote was 416 to 0, with George W. Crockett Jr(D-Mich) and John Conyers Jr(D-Mich) voting present....Aides to Crockett and Conyers said they abstained by voting present because of concern over the tone of the resolution. An aide said Conyers feared the language would only further isolate the Soviets and exacerbate the Cold War." 1985 Endorser of the Soviet youth front, "12th World Festival of Youth and Students", Moscow. The WFY was run by two Soviet fronts, the World Federation of Democratic Youth and the International Union of Students, while its US office was run by the CPUSA through a festival "Preparatory Committee." 1986 Conyers was as a keynote speaker at the "Second Annual Conference on Socialism and Activism", December 5-7th, 1986, at Hunter College, New York City. The event was co-sponsored by the Chinese-funded, Maoist-oriented "The Guardian", "The Progressive", a socialist magazine dominated at that time by its creator, the Institute for Policy Studies, "Socialist Review" and the Marxist controlled "Pacifica radio station". Other keynote speakers included Dr Benjamin Spock and Bernie Sanders, now an openly socialist Independent Senator from Vermont and a founder of the Congressional Progressive Caucus. Sponsor of the CPUSA front "Fund for Open Information and Accountability, Inc.", a group devoted to exposing government internal security operations and documents. Another congressman sponsoring this group was Parren Mitchell (D-MD), long suspected of being a covert CPUSA member. 1989 Conyers was the keynote banquet speaker at the US Peace Council's "Tenth Anniversary Conference" (People's Daily World, 1st November 1989). 1992 Conyers sponsored the "International Rally Peace For Cuba", held in New York City on January 25th, 1992. Among the list of this Castro-support group were Rep. Major Owens (D-NY), Maxine Waters (D-CA, both fellow members of the Congressional Progressive Caucus. During the '90s Conyers served, with Maxine Waters, on the board of the "Aristide Foundation for Democracy," a support organisation for Haiti's deposed Marxist President Jean-Bernard Aristide. Since 2004, Conyers has been a board member (with Maxine Waters) of Progressive Democrats of America, a leftist pressure group within the Democratic Party which has ties to the CPUSA. 2006 4th February, a sponsor, along with Representatives Cynthia McKinney (D-Ga), Major Owens (D-NY), Bobby Rush (D-Ill and Maxine Waters (D-CA),(all members of the Congressional progressive Caucus) of the Revolutionary Communist Party organized "World Can't Wait" anti Iraq War protest in Washington DC. December 2006, Conyers released a "People's Agenda" which reflects, almost exactly, CPUSA policy. It was immediately featured in the CPUSA's theoretical journal, Political Affairs. The obvious question arises-is Conyers now, or has he ever been, a covert member of the CPUSA? The closest anyone has come to answering this question is US writer Max Friedman. There have been numerous members of the Communist Party and their sympathizers in the US Congress since the 1930s, and a few are suspected of being KGB agents of influence, if not actual KGB agents. Some of the CPers/sympathizers in Congress were in powerful positions, including chairmanships of both full and subcommittees, and used these positions to promote communist propaganda and disinformation, to attack US foreign policy, to discover intelligence secrets, to undermine and eventually destroy internal-security committees/agencies, and to aid our communist enemies. Freedom of Information requests to the FBI have revealed the communist ties of the late Rep. Emanual Cellers and Samuel Dickstein, as well as those of the late Leonard Bernstein and so-called journalist I F "Izzy" Stone (a probable KGB-agent-of influence). Often congressional aides were part of the equation, with some of them being active in CPUSA-funded think tanks such as the Institute for Policy Studies or the Fund For Peace operations including the Center for International Policy. A few congressmen/women have/had CPUSA front records that stretch for miles, and some also supported the Trotskyite Communists of the Socialist Workers Party and the once-Trots, now Stalinists, Workers World Party, whose fronts are led by Ramsey Clark, the former attorney general under Lyndon Johnson. If you want names of these people, here are a few of the worst: Abzug, Conyers, Dellums, G. Miller, D. Edwards, Rangel, Kastenmeier, Harkin, Kerry, Braun, P. Burton, P. Mitchell, C. Hayes (CPUSA), G. Crockett (CPUSA), T. Weiss, and about another dozen with lesser numbers of fronts or less serious affiliations. For a few of these mentioned congressional names, there is some serious evidence that they were secret members of the CPUSA, but this for a future story. For some congressional names not mentioned here who were reportedly members of the CPUSA, I am working on finding the documents that will allow me to reveal the truth about them. Don't ask me how I know about them, I do. Unfortunately, I can't tell you all of it right now until the proof is in my hands, and getting them declassified for public review is going to be one heck of a battle. Rep. John Conyers (D-Mich) tried his best to make sure that these documents were either destroyed or sealed for 50 years (when the House Internal Security Committee was destroyed in 1975). He knows what's in them and fears the devastating damage that they will do to him and the Democratic Party should they ever be released. His own record is a beaut, even just the public one. The US Democratic Party is full of people, who if they lived in France or Italy, would be open members of the Communist Party. 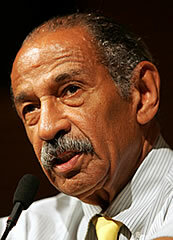 I believe that John Conyers, one of the most powerful figures in Congress, is one such person. This guy was interviewed by Michael Moore for one of his docos. Moore asked him why nobody had bothered to read the Patriot Act before voting for it. Conyers said something to the effect of, "Son, do you know long it would take for us to read all the bills that are passed?" In other words, no one in the congress or senate knows what the hell they are voting for. We have the same problem in NZ. Gives a lot of power to those who draft the laws, I would think. It's not a matter of giving them power and that being a bad thing, it is a matter of them not actually READING what is in the laws that they are voting for. That could be a slight problem. And we have never had a bill passed in this country that is even remotely as draconian as the Patriot Act. Thank goodness. Mounties Spied On Keifer's Granddaddy!